Concussion seems to be the “injury du jour” these days. Hockey players, in particular, are in the news frequently for the hits they are taking and the long-term effects they can have on them. And the more talented or higher profile the athlete, the higher the scrutiny of their injury and care. The NHL’s Sidney Crosby has been in the news often with constant observation of his recovery and eventual return to play. Many careers have been shortened due to brain injury and contact sports create an inherent risk, so it is incumbent upon those who manage professional leagues to take steps to protect their players. Part of Sidney Crosby’s rehabilitation has involved the work of Dr. Ted Carrick, a Canadian chiropractic neurologist who works in Florida and Georgia. In addition to chiropractic care, Dr. Carrick has developed a “whole-body gyroscope” which is essentially a chair that spins upside down with the aim to stimulate the brain and cause it to compensate for the damaged areas and help to re-train those same damaged areas. The hope is to improve the vestibular system which contributes to balance and spatial awareness. Later it was revealed that Crosby had a fracture and sprain/strain injuries as well, which would make sense, given the severity of the traumas he sustained. Research at Boston University on brains donated by former athletes has shown the severity of brain deterioration that results from CTE: chronic traumatic encephalopathy, the end result of successive concussions. Examination of former Buffalo Sabre Rick Martin’s brain showed a frightening amount of damage, despite only having one serious concussion documented during his career when he fell and his head (without a helmet) struck the ice. The scientist attributes such marked degeneration due to the likelihood of previous concussions that were not diagnosed, and just the rough nature of the sport with frequent incidental contact of the head against hard objects such as elbows, shoulders and the boards. The take-home message is that all head injuries must be taken seriously, their recovery not hastened and all appropriate preventive measures possible instituted. Management of concussion involves management of the signs and symptoms that comprise four categories: physical, cognitive, emotional and sleep. It had been traditionally believed that loss of consciousness was the primary predictor of post- concussion severity, but research has revealed it is actually on-field amnesia that poses the worst prognosis. 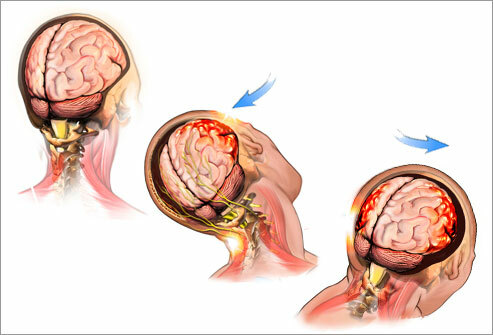 Common symptoms of concussion include: headache, nausea, sensitivity to light or noise, concentration or memory problems and sleep difficulties. These complaints can last for months and if the athlete is allowed to participate too soon and suffers another injury, the results can be potentially life-threatening in a worst-case scenario, but more likely, cause exacerbation of previous symptoms and increase the likelihood of long-term effects. Such is the culture of hockey where players were expected to shake-it-off and return to play as soon as possible. With the increase in the size and speed of players, compounded by changes in equipment (more armour-like than pad-like) the severity of concussion injuries has spiked and pro players from the eighties and nineties, men in their 40’s, are now having serious difficulties and showing neurological symptoms that were very uncommon not so long ago. Factor in the enforcers, whose job it is to fight, and the result is that post-concussion complaints and eventual CTE is going to be an unfortunate eventuality for many in the sport. It’s a grim picture but if league-governing bodies at all levels, coaches and the players themselves make substantive changes, the current trend can be mitigated and the sport can once again be one of speed and excitement, not one of when a player is injured, but if.